An inert rifle round consisting of fired brass case, fired indented primer and copper jacketed bullet head, in .300 Winchester Magnum. Also known as .300 Win Mag, 300WM or 7.62x67. 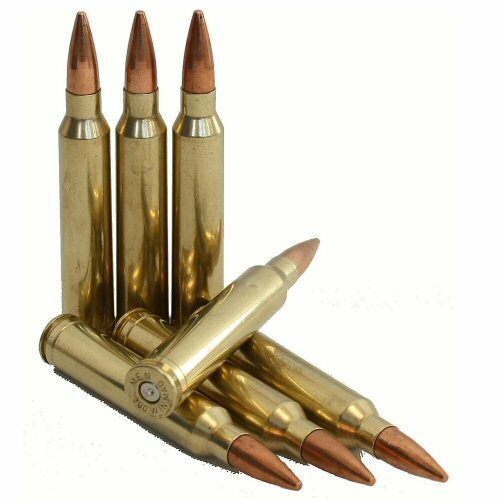 The .300 Win Mag round is a .30 calibre bullet with a flatter trajectory out to 1000 metres due to the higher muzzle energy which surpasses even the Springfield 30-06. This calibre is used by military and law enforcement for long range sniping and marksmanship. First developed in 1963 by Winchester in use with the Model 70 rifle, but adopted across a wide range of popular rifles including the Remington 700. Military and law enforcement use includes the US M24 Sniper Weapon System, US Navy Mk13, Savage 110BA, Finnish Sako TRG-41, German G22. Price is for ONE inert round only. Please be advised that inert rounds may only be shipped via UPS courier outside the UK.